Innovators and entrepreneurs on the outside, Yashovardhan and Anu Saboo, the dynamic duo behind Ethos (the chain of luxury watch boutiques), are all about creativity and a penchant for all things beautiful when you look deeper…. It is a pleasant sunny afternoon with a delicate nip in the air. Nestled amidst a lush green cover of trees in the heart of Chandigarh is the Saboo residence. Walking down the driveway covered with painstakingly landscaped gardens on both sides, I form a mental picture of the couple. Warm and friendly, just as I’d imagined them to be, Yashovardhan and Anu Saboo are nothing like your usual corporate couple. Their love for green is evident early on, from their conversation, as they tell me how they’ve actively participated, won and judged numerous gardening shows in the city. “This was a winter home for my in-laws. The original house was built on stilts with a splendid lake view,” explains Anu , pointing towards the Sukhna Lake which is now overshadowed by buildings that have come up around the area. “A lot of the artefacts have been curated by her and you can see how everything is minimalistic and understated,” she adds. Being lovers of contemporary art, synergy and simplicity with an underlying tone of luxury resonate within the interiors of the Saboo home. “Among the most memorable experiences of my life have been visits to the Rodin Garden, the Sistine Chapel and to MOMA. I do buy some Indian art from time to time – but never think of it as an investment. If I think I will continue to like it every time I see it on the walls of my home or office, I feel it is a good purchase,” he elaborates. He goes on to add how photography has been a continuing passion and that calligraphy is a budding new hobby. Besides managing the marketing end of Ethos, Anu finds solace in cooking. To hone her cooking skills, she enrolled in several professional courses at the Ritz in Paris and at Le Cordon Bleu in London. She harbours the dream of opening a café that blends music, art and delectable cuisine. Her love for interiors is evident from the beautifully done up living room area. Everything is harmoniously arranged and thoughtfully placed involving a strong sense of aesthetics. Anu is a perfectionist both at home and at work. Parallel to the growth trajectory of Ethos, her role has diversified over time and she now handles the loyalty programme of Ethos with over 40,000 members, administers the in-house magazine offered to over 7,000 customers, monitors co-operative structure with over 10 distinct brands, organises the ‘mystery shopping’ internal audit platform for the group and coordinates the all-encompassing training sessions – all with élan. 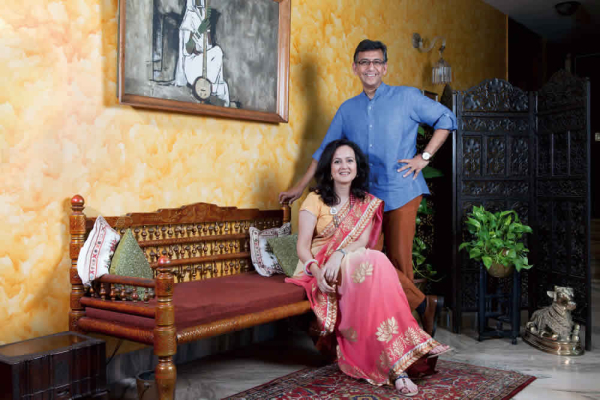 Both Yashovardhan and Anu are avid sport enthusiasts. “I have run 12 half-marathons and hope to run at least a few full marathons while I can. Running long-distance a few days a week while listening to music that I like is the ultimate stress-buster and close to sacred time,” he reveals. “I love the few skiing weekends every year that I manage to sneak in during winter business trips to Switzerland,” he adds. Perhaps this love for scenic beauty has translated into the open and resplendent ode to nature surrounding their home. The light outside is now perfect and we walk towards the garden area for the final shot. The garden that the couple has done up on their own, offers a picturesque setting. Punctuated with sculptures curated from Jaipur, we freeze on the stone staircase where the charming and energetic couple poses elegantly, with their golden retriever for company.